CANTON, OH. — Seven NFL legends including former NY Giants Michael Strahan, Buffalo Bills Andre Reed, defensive end Claude Humphrey, two first-time ballot selections, Tampa Bay linebacker Derrick Brooks and Seattle offensive tackle Walter Jones were inducted on Saturday, Aug 2 into the NFL Hall of Fame. Arizona/St. Louis defensive back Aeneas Williams and Oakland’s Ray Guy, the first full-time punter, were also inducted. 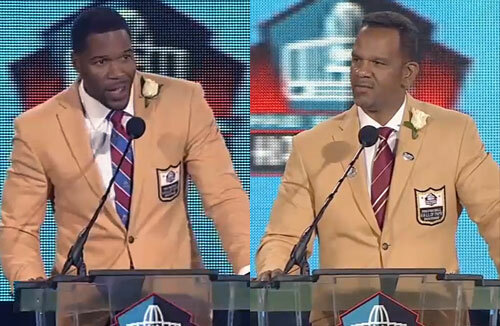 Photo shows former New York Giants, Michael Strahan (L) and Buffalo Bills, Andre Reed (R) delivering their NFL Hall of Fame enshrinement speech on August 2, 2014. Fox Sports’ Jay Glazer introduced Michael Strahan, who spoke for 34 minutes. Strahan did not cry. Reed also provided one of the more emotional moments of the ceremony. While speaking to Jim Kelly: “12+83 always = 6,” Kelly mouthed the words along with him. Then, after Reed concluded his speech, Kelly threw him one last pass. Sports Speakers 360 is a booking agent for pro athletes. If you would like to book Andre Reed or Michael Strahan for an appearance, contact Andre Reed’s or Michael Strahan’s booking agent for fees at 1.855.303.5450.